The expansion into Wandsworth -- with seven churches joining the two established church shelter circuits in the boroughs of Hammersmith & Fulham and Chelsea & Kensington -- ultimately meant fewer individuals slept on night buses, under awnings and in parks. Every night during the coldest five months of the year, 87 individuals on average were able to find shelter in our network of church halls. Thanks to a growing base of supporters and partner churches, we were able to help a total of 420 individuals off the street for an average of 32 nights. That’s up from 253 individuals staying in our shelters last year -- a 62% rise. The three-shelter model gave us much more flexibility this winter, enabling us to turn on a sixpence when vulnerable people came to our doors. 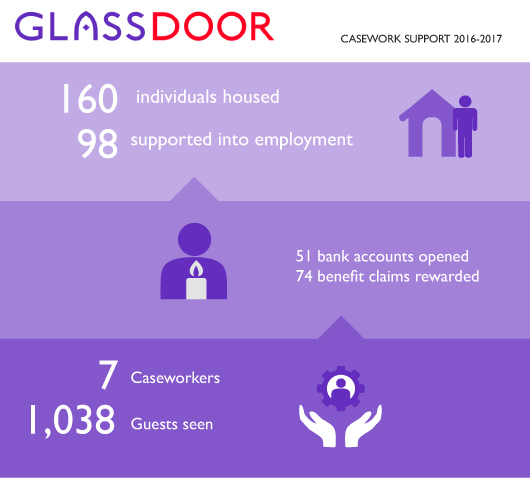 Our casework team advised over a thousand individuals this past year, helping 160 guests find housing and 98 find jobs. "The context the casework service operates in is constantly evolving," notes senior caseworker Neil Parkinson. "After years of homeless people being funnelled into the private rented sector, the introduction of the Benefit Cap has made studio flats unaffordable for most people in receipt of benefits." The only option most of our guests can hope for is to find shared accommodation in the private rental market. Neil gives the example of a British woman in her early sixties -- we'll call her Jane -- who lost work and was sleeping on night buses before coming to Glass Door. The casework team helped her update her CV, apply for jobs, supplied clothes to wear for interviews, and helped ensure she received the maximum benefits for which she was entitled under the Benefit Cap. With funds coming in from temporary work and benefits, our team helped her search for somewhere suitable to rent. The cap meant Jane had no option but to share a flat with two women she didn't know. Neil mentions that many older people struggle when they need to share accommodation with others. Jane isn't sleeping rough anymore, but Neil worries her living situation is still unstable. Our guests who are European Nationals are also feeling the effects of changes to benefits and policy. For example, 25 of our guests have been caught in a new Home Office policy that grants immigration officers the power to arrest, detain and remove EEA nationals sleeping rough in the UK. Officers do not even need a warrant under the new policy, dubbed "Operation Adoze". One of our guests had been picked up and put into detention even though he has a legal right to reside in the UK; he has lived and worked here for eleven years. He was eventually released, but without his ID. Our team made sure he found legal representation and fought to have his ID returned, although his health has rapidly deteriorated during the ordeal. "Despite the challenges, it has been a very successful year in terms of helping more people than ever out of homelessness," Neil says. The casework team -- Neil, Boguslaw, Anna, Lewis, Jay, Sarah and Karolina -- have between them not only supported a record number of guests off the streets, they've also helped guests access healthcare, open bank accounts, apply for lost ID, and get other specialist support. The night shelters may only be able to offer space on the floor of a church hall, but our homeless guests tell us how much it meant. We're particularly encouraged that guests felt more confident, more optimistic, and more supported than when they arrived. We collect this feedback anonymously twice a year -- in the middle and at the end of shelter season. "I was sleeping on buses and had no rest, food or attention…. You have been helpful by giving me shelter and food. Thanks for your good work," wrote a man in his forties. "The volunteers are excellent, easy to talk to and down to earth. The shelters have given me a chance to look for a job and helped me to improve my mental health." wrote a British man in his 40s. "When I was under the sky, when the temperature was -3 degrees, I didn't think I could get through to 2017. I'm very grateful Glass Door exists," wrote a British man in his fifties. Volunteers sit, eat and chat with guests, welcoming them as they would anyone else entering their homes. We often hear from volunteers that they receive more than they give from the experience, and 2016-2017 was no exception. Unsurprisingly given the shelter expansion, we had a record number of volunteers register. Over 900 people signed up over the course of the winter, and their feedback on the experience has been overwhelmingly positive. 97% of the 152 volunteers who provided feedback said that they were either "extremely" or "very" satisfied with their volunteer experience, and the same percentage said they would recommend Glass Door as a place to volunteer or support. Volunteers reported they had spent seven hours a month on average helping out in the shelter or day centre. 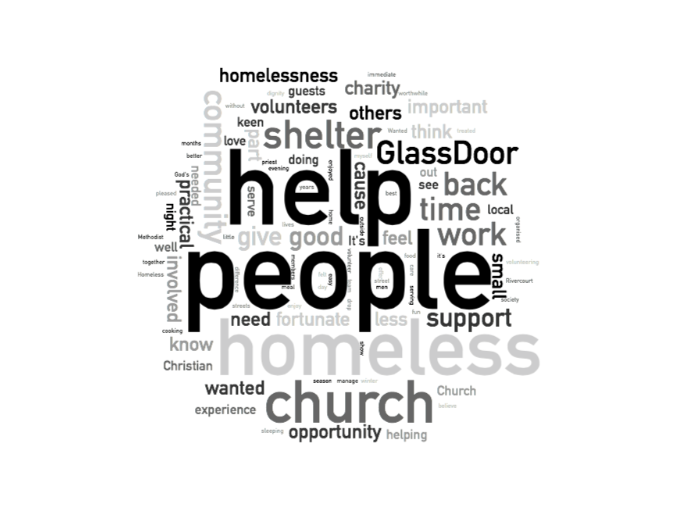 When asked why they chose to volunteer with Glass Door, the answers were thoughtful but hard to summarise. Answers highlight a desire to help homeless people and to give back to the community and the church. Even with the increase in bed spaces and a growing casework team this year, we still have many more people looking to access our shelters than we can accommodate. We could double the number of our shelters again and they would still be full. The need for our emergency shelters shows no sign of abating. Government benefits have been cut-back, and the property market in London remains prohibitively high for many. Rough sleeping in England has risen dramatically since 2010 – up 16% last year and 30% the year before. We believe no one should have to sleep on the streets of London. Without the stability of somewhere safe to sleep, everything else falls apart: jobs are lost, health deteriorates. Despite the daunting situation, it’s heartening to find churches and individuals in the community are rising to the occasion.We have a formula that is working, and we hope our supporters continue to help us in our mission to get people off the street. Looking ahead, the dates for next winter are currently set to open on Monday 6 November and we plan to stay open through to Sunday 8 April 2018. This would take us right through Easter, which can be a big ask on volunteers and churches, but past experience has shown that closing before the end of March is too risky in terms of possible freezing weather. We also aim to maximise existing shelter space, especially in Wandsworth, to increase the overall capacity in the shelters to 100 guests a night. We plan to continue to invest efforts in supporting people off the streets. Thanks to long-term funding, we have been able to keep our dedicated casework team in place all-year round. One of our caseworkers, Lewis, will be taking on a new role in tenancy support to help guests stay in their new found homes, while Anna focuses on immigration and Jay continues his efforts with supporting guests into work. From now until November, anyone looking for our help can be directed to any of the drop-ins where our caseworkers are on hand to support new and existing guests.